Many tourists in western Kansas are familiar with the Niobrara Chalk formations of Castle Rock and Monument Rocks National Landmark. These ancient chalk spires have “fingers” 70-feet tall reaching far above the prairie. 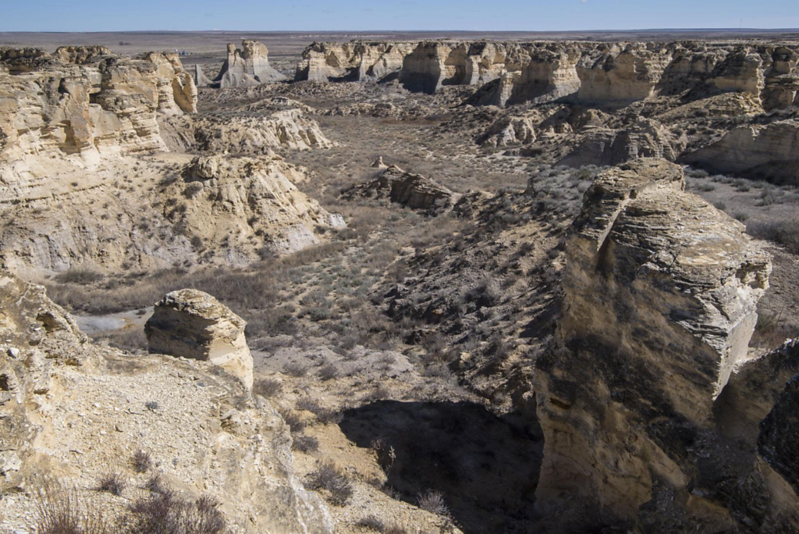 These formations are dwarfed, however, by the scale of Little Jerusalem, a 300-acre site in Logan County being prepared for the public by The Nature Conservancy. Little Jerusalem is a vast expanse of chalk spires and ravines, practically untouched for 85 million years. Formed after the inland sea covering the high plains dried, the spires are all that remains from an ancient oyster bed. Giant clams, more than three feet wide, leave their fossils jutting out of the canyon walls, and imprints of oysters and barnacles crunch with every step on the ground. The Nature Conservancy purchased the property on Oct. 5, 2016, and it is managed by Smoky Valley Ranch project coordinator Matt Bain, who said Little Jerusalem will be the perfect place for nature lovers to explore. Located 20 miles north of Scott City and just west of U.S. Highway 83 on the Western Vistas Byway, Bain hopes that the opening of Little Jerusalem will add to the tourism and conservation efforts of the area. Bain said that the site has been known by many names through the years. It was first known as the Logan County Badlands by pioneers, then Castle City, and eventually, Little Jerusalem. Because of farming and ranching, only 20 percent of the native intact prairie remains in Kansas. Rare and unique flora and fauna call the winding ravines of Little Jerusalem home. One species is Great Plains Wild Buckwheat, a short shrub with spiny twigs and green leaves. Little Jerusalem hosts the largest population of the plant, and beyond western Kansas, the species is found nowhere on earth. Bain said that The Nature Conservancy is still in the planning stages of the site, so he couldn’t provide an opening date or exact details about trail layouts, but he hopes to begin with a parking lot and a short handicap-accessible trail down to the main formations. He said the main goal is to present the area in a way that guests can enjoy the scenery without disrupting millions of years worth of fossils. Once open, it’s expected fossil hunters from across the region will travel to Little Jerusalem to examine all of the relics left by the ocean. Western Kansas is already known for its large number of aquatic fossils, including shark teeth and skeletons of the mighty Mosasaur, which can be up to 50 feet long. Little Jerusalem is the remains of an oyster bed, which likely looked a lot like coral reefs do today. Laura Wilson, curator of paleontology at the Sternberg Museum of Natural History in Hays, said the staff is excited to see what secrets the rocks may be holding. The history of the location doesn’t stop 85 million years ago. Pioneers used the rocks as markers along the Smoky Hill Trail, and Bain said pioneers and Native Americans left their mark on the ancient rocks. The site will have a no collection policy, so that every guest can enjoy the fossils and artifacts. If a major archaeological find is discovered, the Sternberg Museum of Natural History in Hays will be called out to excavate. Bain said that it is extremely important to conserve the intact prairie, and the best way to do that is to let children experience places like Little Jerusalem.